KAMPALA – Two youths from the renowned jobless brotherhood Norman Tumumbise and Robert Mayanja are to face immediate trial on allegations of dropping piglets at parliament in 2015. This is after High Court Judge Jane Frances Abodo dismissed their application that was seeking to drop their charges due to illegalities in their case. The two youths had challenged their trial at KCCA court while accusing the then trial magistrate Moses Nabende of refusing to visit the crime scene( locus at parliament) before they begin on their defence. However, after 3 years of trying to dodge their trial, the judge has ruled that it was within the discretionary powers of the trial magistrate to visit a locus if he /she feels that the said visit will supplement the evidence already on record. The youths had also complained that the chief magistrate re-allocated their case file to another magistrate without first consulting them. However, the judge explained that the chief magistrate has a supervisory role over other magistrates and has powers to allocate a case file to any other magistrate without first consulting the suspects. Tumumbise and Mayanja are known for dropping piglets around Kampala city while showing dissatisfaction about the increasing levels of youth unemployment. 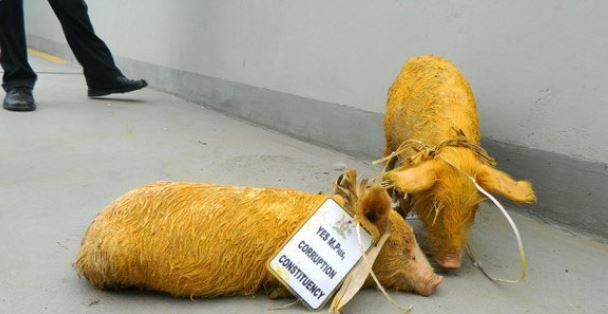 The pigs sometimes are soaked in different colours and bearing names of Mps.